Last night I was invited to Sunday dinner to try fårikål, Norway’s national dish. It is not something I would likely have tried on my own since you won’t find it in many restaurants. Fårikål translates to ‘sheep in cabbage’, and is just that. 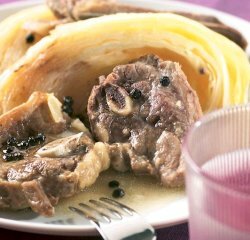 Sheep and cabbage stewed with whole black pepper for several hours and served with boiled potatoes. It is traditionally served around this time of year, as this was the time of the year when they would slaughter young lambs. I’m told it’s actually best on the third day, once the sheep, cabbage, and pepper flavors have had a chance to fully meld, but I found it to be pretty good even on the first day. Would I make fårikål myself? I’m not sure. –Not because it isn’t good, but because I don’t think I could resist the urge to dress it up, even though it doesn’t really need it. If nothing else, it does make make me want to cook up a big batch of stew, and I really am glad I got a chance to try it! One of my first posts was about my trials with Telenor and how I refused to use them after the lack of service I received from them. Instead, I went and signed up with Start. First, I contacted them and had an install date in less than 24 hours. Unfortunately not everything went perfect. They got my phone number wrong, so when the installer tried to contact me to arrange the installation, they couldn’t get in touch with me. After that, apparently the installer screwed up the installation, and in the end it took about a week longer than expected to get connected. However, that was the fault of the installers, not Start. In fact, every time I’ve spoken with Start staff, they’ve been very friendly, and have always done their best to help. Even when I managed to screw up my connection by flushing the DHCP client (although I maintain that if I was given access to do that, I should have been given full access! 🙂 ) they sent a courier with a new modem so that I was able to get online the next day, and they even configured it the way I requested it. I’ve had their service for about two weeks now, and I’ve been very impressed. The service isn’t as fast as I was initially told, but the speed has been consistent, and much better than the DSL service I was stuck with in London. And for what I pay, I’m still getting twice the speed that Telenor offers for the same price. So, at the moment, if someone is looking for DSL service, I recommend Start since the people there are actually interested in, and willing to, provide good service. The American Embassy is a very unique building, especially given it’s location. As you can see by the picture, it’s very black, triangluar, and pretty much across the street from the palace. And it has a tall, very ugly fence surrounding the place. To say that it’s uninviting is an understatement. Now, first off, I don’t have complaints about anyone working at the embassy. The times I had to go there, none of them were ever rude to me, and they were took care of my request for more passport pages quickly. However, I have to be honest and say that I’m not proud of the embassy. I realize the current government feels the need to do a lot to “secure” the building, but I believe that they could secure the building without making it feel like you’re trying to enter a fortress. Not only that, but they want to build a new embassy, way out of the center of the town, and at a location that the residents claim would destroy the last green area they have near them. The embassy has upset Norwegians by trying to get the process expedited and attempting to circumvent the local government. So, when I visited the embassy around 9am on a Thursday, I think, there was already a long line. Luckily for me, they have a separate line for American citizens, and nobody was waiting there, so I only had to wait around 5-10 minutes. You first go into this guardhouse, where you get searched more thoroughly then you do at the airport. You can’t take much in with you – your ID and documents you need, and your cash. Then you head to a side entrance and come into a pretty small, dingy area where there are one set of windows for Americans, and another set for everyone else. Since there was only one American ahead of me, I didn’t have to wait there long. I was able to drop my passport off and pick it up later in the day after they added the extra pages (of course, I had to go through security again, and it was just as much fun as before, although I left some stuff behind so I was able to get through faster. My problem is that the embassy isn’t a place you want to go. Although the people are polite, the environment doesn’t encourage you to make use of their services unless you have no other choice. Back in the UK, some Australians loved to talk about how the Australian embassy in London have wine tastings and other events. 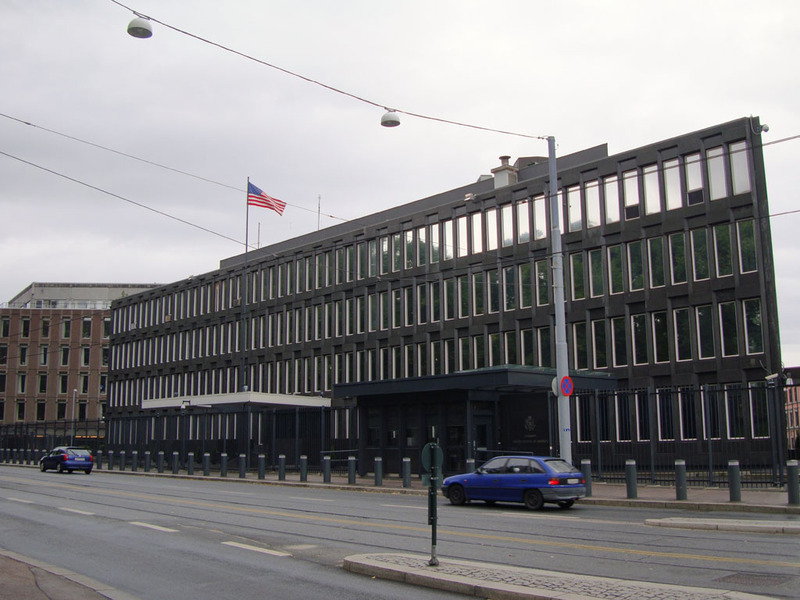 In case you’re wondering, the other embassies I’ve passed in Oslo tend to be more traditional looking buildings, and if they have a fence, it’s usually more ornamental. Even the Israeli embassy doesn’t look like a fortress! St. Hanshaugen park, constructed between 1876 and 1886, is a bit more than a five minute walk from my apartment. I headed over there on Wednesday to find out what was there. It was actually a bit surreal. The photo on the left was taken around 5pm, and you can see the empty reflecting pool that is built over a reservoir. During the weekends, and especially in the main part of the summer, the park may look quite a bit different, but when I was there, it actually felt… Desolate. A few other people were passing through, and I saw a couple of people taking advantage of the peace to do some reading. But, even accounting for the lack of people, the place felt empty and deserted. There are a couple of interesting sculptures in the park, which I may try to find out more information about and write posts about later. It’s always nice to know where parks are in a city, even if you don’t visit them often. And Oslo has a lot of parks and other green spaces. 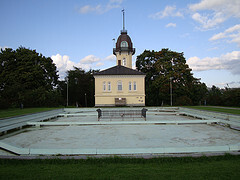 St. Hanshaugen isn’t even close to being the largest, but it’s still somewhat around 22 acres. If you are currently abroad, or planning on moving abroad soon, what would you do if a family member passed away while you’re living outside of the country? Do you have plans, and a contingency fund with enough money to fly home at short notice if necessary? I ask this because my Grandmother passed away on Sunday morning. Luckily, I saw her a week before at my brother’s wedding, and she was doing fine then, except for a fall she had recently. Nobody expected this. –After a mild heart attack on Saturday, she was stable and they were planning on using a catheter to try and clear any blocks on Sunday morning. Unfortunately, during the night, she took a turn for the worse, and they weren’t able to keep her alive long enough for us to make the 2 1/2 hour trip to the hospital. Keep in touch with family regularly. No, you don’t necessarily have to call everyone once a week. But once a month would probably be a good idea. Have a contingency fund ready with enough money for a roundtrip ticket purchased at the last minute. I realize this can be hard to calculate, but you can expect to need at least $2000, and realistically, $4000 would be a better number to have in your savings account. Try not to dwell on this possibility. Remember, this isn’t something that you expect to happen, and you don’t need to worry yourself sick over this, but rather acknowledge as a possibility. Maybe this is a useful post for people, and maybe it isn’t. I don’t want to make people think they shouldn’t live abroad because of this risk. I just don’t want you to forget that it’s something you may have to deal with. So, I did something stupid on Friday. Luckily, it all worked out fine. –I made it to the States on time and hassle free, except for the beginning of the trip, which was my fault. The mistake? Quite simply, I forgot to check which airport I was flying out of, and ended up going to the wrong one. So, the lesson to learn from this is that Oslo has a couple of airports. Gardermoen is the main one, but there is also one called Rygge. They are about 2 hours apart by car, so if you go to the wrong one, you could be screwed. Luckily, I flew SAS and they have flights out of both airports, and they put me on a flight from the airport I went to without charging me any extra fees. So, although I’m rather embarrassed to admit what happened, everything worked out OK, and I was reminded that I need to make sure to pay attention to where my flights are flying in and out of. And as far as I’m concerned, SAS is a good airline that still cares about their customers, unlike pretty much every American airline around today. Didn’t I just get here? So after two months in Oslo, it’s time for a quick trip back to the States. –My first since I moved to Europe close to two years ago. Needless to say, this will probably mean fewer posts over the next couple of weeks. On the bright side, however, I get to find out if SAS’ Economy Extra seating is any good. Of course, almost anything is better than flying a U.S. carrier these days, so I’m not too worried. Norway has an interesting history. For many years they were in a union with Denmark (not by choice), and then they were sort of given to Sweden in the early 19th century, which lasted until 1905. 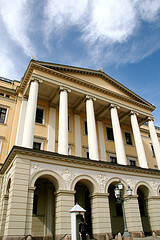 It was during the union with Sweden that the Royal Palace was built. It’s a small palace compared to others in Europe, because it wasn’t meant to be the primary residence of a royal family. Today Norway’s king and queen live and do their work in the palace. The crown prince also has offices here as well. If you are going to be in Oslo in July or early August, you should consider taking the tour. They give tours in English about three times a day during this time. Buy your tickets in advance at the post office, otherwise they might sell out before you can get a ticket. One downer is that they don’t let you take any pictures, and the palace’s website has all their pictures in flash files. The tour takes you through the vestibule, the bird room, the “family” dining room, the ballroom, another dining hall, and the royal chapel, plus some other rooms. A lot of it is very ornate, much as you’d expect of a palace, although the chapel is actually fairly plain. It doesn’t necessarily show you how the king and queen live, but you get to see rooms that they use fairly often. Moving overseas can turn your life upside down. Usually this is a good thing, but it can easily introduce negatives. Before I moved overseas, I was doing a good job of working out regularly. That good habit, however, was lost immediately when I moved to London. In my defense, living in London while earning an American wage left me with little money to pay for a gym membership. This, of course, resulted in me gaining back a lot (OK, most) of the weight I had previously lost. Now that I’m in Oslo, earning a decent wage for Europe, and working for a company that covers half the cost of a gym membership, I’ve decided that I need to get back into the habit of going to the gym regularly. No matter how much I’m not a huge fan of working out, it does have many benefits. My recommendation for others is to take time before a big move to determine what positive routines you have and make the extra effort to keep them. It may be hard at times, but retaining some stability will help you adapt to your new environment. And if you can use the opportunity to drop some bad habits, even better! I’m headed for the bus stop, on my way home for the night. It’s closing in on half twelve… It’ll be Friday soon. At the bus stop, I look up. The rain – more of a mist, really, is slowly coming down, and reflecting the light. It’s not really dark, of course – it never is in London. The streetlights shine, and all the lights of the city reflect off the clouds, creating a soft glow. Cars drive up and down the street, but I don’t really hear them since I have my headphones on. The night, the mist, the buildings create the mood. It happens once in a while: I get this feeling of awe and amazement; a fluttering in my chest, a feeling of energy. I’m living in London. LONDON. Never mind that I’ve been here over a year. I’m thousands of miles from where I grew up, with an ocean between us. But I’m here, and it’s amazing. The rain starts to pick up, and the temperature feels like it’s dropping. A couple of people hail cabs rather than wait any longer. The ubiquitous black cabs – not the only ones you see on the street these days – but the ones that scream London stop and pick them up. It’s raining harder now, and the atmosphere is changed. The awe slowly fades, and I wonder: where’s the damn bus? I make no claim as to the quality of my writing, but hopefully this will start to give you an idea of what it means to live overseas.